Mambo Jambo might just be the biggest acoustic duo you’ll ever see, a truly unique two-piece with their own rhythmic and joyful sound, a dozen or more instruments, male/female harmony vocals, a friendly stage presence, and a seemingly endless variety of roots, world, folk and jazz styles up their sleeves – Pete and Frankie have been gathering admirers at shows and festivals the length and breadth of the country. A fabulous musical treat is in store wherever they roll up, their tour bus packed to the brim with sax, guitars, banjo, clarinet, flute, accordion, Cuban tres, Brazilian ukulele, all kinds of percussion including suitcase and spoons, plus another instrument or two if they find room – all expertly played! 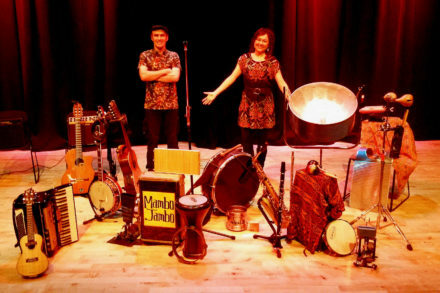 With songs, dancing, listening as well as bubbles, percussion, props and informal introductions, this is a fun and informal gig for adults and their young children. *** Please note this session is specifically for 0-3 year olds. Please see Concerteenies (up to 1s) if you'd prefer a session for non-movers. - Main pub doors open at 10am and the Backroom doors at 10.15. - You are responsible for the safety of your own chidren and belongings.